E15 Initiative | How Commodity-Dependent Are Latin American Economies? E15 Initiative | How Commodity-Dependent Are Latin American Economies? 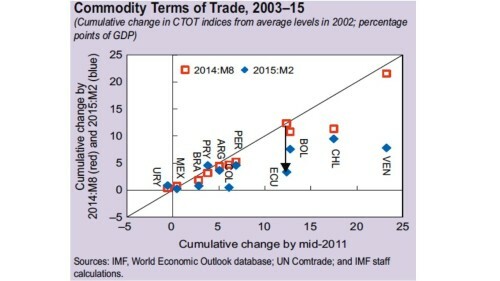 The end of the upswing phase of the commodity price super-cycle after its peak in 2011 has lowered economic growth prospects in most of Latin America. While that broad statement can hardly be disputed, chapter 3 of the latest IMF Western Hemisphere Regional Economic Outlook called attention to underlying significant differences among countries in the region. Growth implications of the commodity price evolution have varied substantially as a result of commodity-specific price patterns and country-specific exposures and composition of commodity specialization. 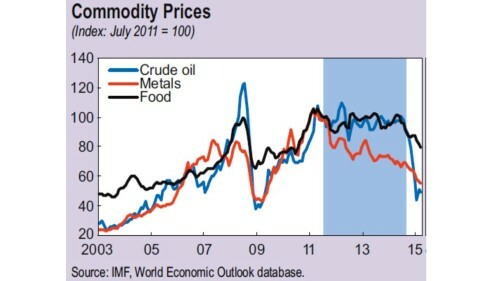 Figure 1 depicts the three broad groups of commodity prices as following an overall common cyclical path since 2002. After a strong upswing lasting until the 2008 financial crisis and a subsequent recovery from the plunge, mid-2011 has been dubbed the “sunset of the super-cycle”. Prices definitely ceased to climb during the plateau period (shaded area) – IMF (2015, p.43) – and the three groups have all moved to lower levels after mid-2004. However, Figure 1 also shows that evolution as taking place with different intensities. As we highlighted two years ago – (Canuto, 2013) – the dynamics of fundamentals in terms of relative supply and demand trends in the markets for each group were then divergent enough to lead to differences like those identified during the plateau period. In the case of crude oil, sector-specific supply-side developments were responsible for the sudden fall during the second half of 2014 (Canuto, 2015). The differentiation is starker when one disaggregates the three groups. A net exporter (importer) of a commodity enjoys (suffers from) a manna-from-heaven gain (loss) when its price increases. The extent to which that price retreats back after the end of the upswing phase determines how much of that gain (loss) is reduced – or even possibly reversed. Therefore, country-specific impacts of the commodity price super-cycle have depended on which commodities – and how much of each of them – a country exports and imports. IMF (2015, ch. 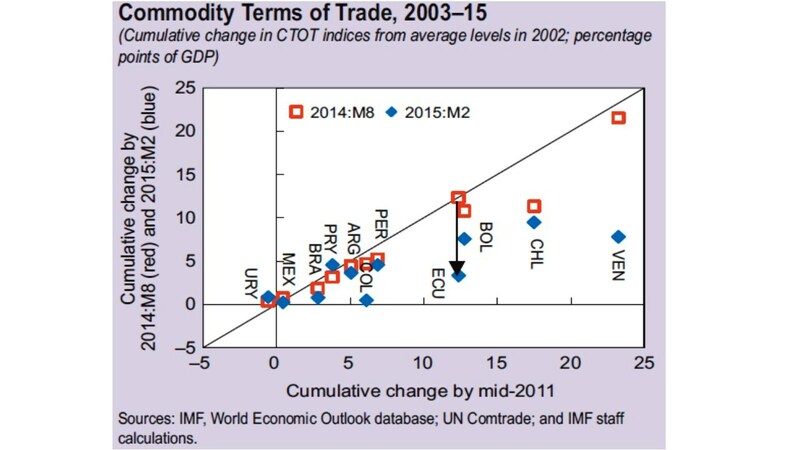 3) brings estimates of country-specific “commodity terms of trade” (CTOT) indices across the region. Those are indices in which price changes of individual commodities are weighted according to their (net) export value, and are normalized by GDP. A certain increase (decrease) in CTOT is thus a way to gauge the net gain (loss) of commodity price movements in GDP terms. 1. As one can see on the horizontal axis, except for Uruguay, all Latin American countries therein derived GDP gains from the upswing phase. The ascent stage of the cycle was a potential economic blessing for most of Latin America. 2. Baskets of commodity exports and imports determined how much of that gain was retained during the plateau period (red squares) and afterwards (blue diamonds). 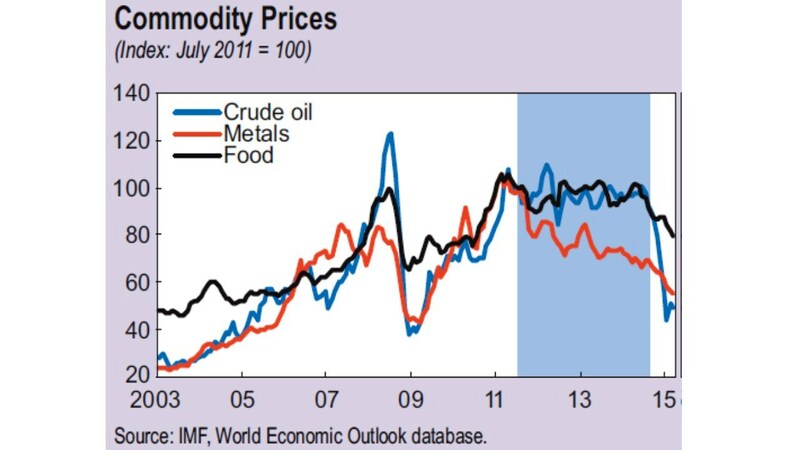 This follows from different compositions of commodity specialization regarding metals, food and oil and their diverging price patterns over time. 3. Commodity prices have not in general declined to levels below those in 2002 and, therefore, the manna-from-heaven gains accrued until now have not been completely reversed. However, those gains were accrued in past and current GDP levels, while the contribution of commodity price shocks to GDP growth rates has become negative after the price peak. Positive commodity price shocks have multiplier-accelerator effects beyond changes in CTOTs. Provided that they are seen as permanent or prolonged, they spark investments that benefit directly or indirectly from them. Both potential and actual GDP move up as compared to the absence of shocks. Broad asset price hikes and capital flows may also follow. Nevertheless, once positive shocks fade out and corresponding multiplier-accelerator effects have run their course, there will be a deceleration of output growth even if prices stay high. 4. Magnitudes in GDP terms of terms-of-trade gains and their subsequent partial unwinding along the cycle have varied substantially among countries. First-order impacts as measured in Figure 2 do not tell the whole story of implications of commodity price cycles for a country’s economy. Second-order effects – like above mentioned investments, asset price cycles, capital flows and others –depend on sector- and country-specific features in addition to CTOT changes. The nature of economic policies accompanying price shocks can also – positively or negatively – magnify the impacts of those CTOT movements. However, even taking these factors into account, the discrepancies in quantitative relevance of the commodity price super-cycle still look very significant between, say, Venezuela and Chile on the one hand and Brazil, Mexico and Paraguay on the other. Take the case of Brazil. It is true that ups and downs in neighbors’ economies more cyclically affected by commodity prices also weighed on its performance as a consequence of their relevance as markets for Brazilian manufactured products. However, it looks hard to state that the recent performance and macroeconomic prospects of Brazil can be predominantly explained by the commodity price super-cycle. Otaviano Canuto is a member of the E15 Expert Group on Industrial Policy. He is the Executive Director of the International Monetary Fund (IMF).